Illus. in full color. 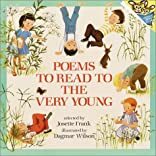 Youngsters who are just beginning to outgrow nursery rhymes will be delighted by this sparkling collection of 43 poems by A.A. Milne, Myra Cohn Livingston, and other well-known poets. .